It's been a while since I participated in Miscellany Monday but I'm back at it. have been having fun using them around the blog. Check it out for yourself! 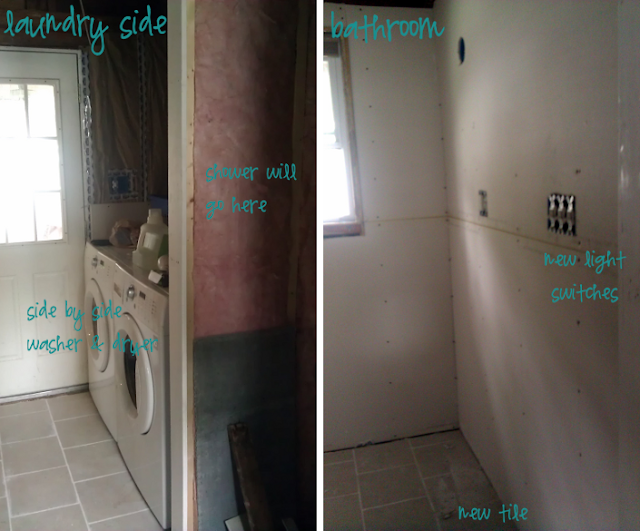 My husband has been working tirelessly on the laundry area and second bathroom. It's changed the look of our back entry entirely. We no longer have to stack the washer and dryer or have to look at the contact paper that was on the walls [in case you missed the before]. The bathroom setup is also changing. We're replacing the cast iron bath tub with a shower. The tile floor is the best part! I could ramble on, but the photos show how well it's coming together [it's still a work in progress]. check out the others who linked up and meet other bloggers! I hope you'll join us for this first one on Thursday, August 18.